Photo from Joutou High School Baseball Club. High school baseball is quite popular as a spectator sport in Japan. Indeed, some baseball fans prefer high school baseball games to professional ones. 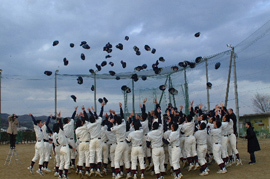 In particular, the National High School Baseball Championship in summer enjoys huge popularity. Local elimination tournaments of this high school championship are held at the prefectural level from June to July. A total of about five thousand teams participate in the local tournaments. As a result of these local tournaments, forty-nine teams take part in the national competition at Koshien Stadium in Hyogo Prefecture in August. The forty-nine teams represent forty-five prefectures and four regions (Japan has forty-seven prefectures, but for this baseball championship, Tokyo is divided into two regions, as is Hokkaido). Many people in Japan enjoy this two-tier competition, the prefecture-level competitions, and the national tournament. First, people enjoy supporting their alma mater, or the school they graduated from, during the prefectural competition. Then, they enjoy supporting their home prefecture teams at Koshien Stadium. The players of the winning team at the final game at Koshien Stadium become local heroes in their prefecture. Playing for the national championship at Koshien Stadium is very prestigious and is regarded as a possible gateway to the professional baseball league.